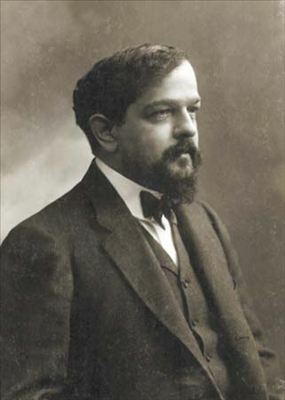 Today is the 151st birthday of one Mr. Claude Debussy. A French composer of fascinating and charming, stand-alone character, Debussy came into the world on this day in 1862; destined to bring the world some of the most memorable and referenced instrumental repertoire. To describe him in a short burst of qualities, Debussy was inspired by, wrote and performed with a sense of curious rebellion –thinking that not all music needed to follow the stringent conventions established by the scholarly traditions of the time. Less emphasis on tonal organization and expected direction, as well as overall use of non-conventional rhythm patterns. Of course, these are just a small handful of the strategies and ideas that Debussy applied to his works; pieces that spanned everything form solo, concerti, opera and chamber repertoire, among many others. Retuning to what I mentioned before about a dichotomy…I’m referring to the fact that even if some of Debussy’s most iconic pieces are deeply seeded in post-Romantic, impressionist color, when experienced and absorbed from a overall auditory perspective, rather than a written structural one, it is hard not to feel the music simply functions to inspire a straightforwardly beautiful and more Romantic -supported mentality. Impressionism having strong ties to instrumental timbre and generalized aural character only boosts this ability to enjoy such works with a looser and less analytical ear, even though the building blocks that create the music can seem to exist in just the opposite way; for example, when any student or researcher should approach Debussy’s music to analyze and draw theoretical connections from it. After all, anyone who played around with whole tone scales, uncommon symphonic instrumental roles and had a passion for the gamelan is providing plenty of scholarly kindling for up-close and personal academic review –the last thing one might associate with a less intimidating and emotionally driven listening experience. As a person who is also for changes to music’s academic and social conventions, today I play your music loudly and proudly!